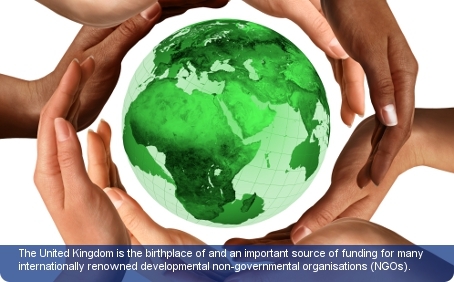 The United Kingdom is the birthplace of and an important source of funding for many internationally renowned developmental non-governmental organisations (NGOs). Sources of their funding range from government agencies like the Department for International Development (DFID) to private individuals. Prominent examples of these renowned NGOs include ActionAid, Amnesty International, Oxfam and Voluntary Service Overseas. The United Kingdom is a key member of the Commonwealth and is an important source of funding for multiple internationally renowned developmental NGOs. The UK is considered a net donor as it has many donor-recipient relationships with many developing Commonwealth countries. Domestically the involvement of organised civil society spans all spheres of human development, social, political and economic across the key sectors of education, health, and the environment. The most recognised and accepted way of registering an NGO is as a charity through the Charity Commission in England and Wales, the Office of the Scottish Charity Regulator in Scotland or the Voluntary Activity Unit of the Department of Health in Northern Ireland. NGOs and CSOs can only register with the Charity Commission if their annual fundraising income exceeds £5,000. The UK’s trade unions have had a powerful role in politics and have a history which spans 150 years. The Trade Union Congress is the trade union centre and the country’s largest union is Unite. Other notable unions are UNISON, Rail Maritime and Transport Union (RMT) ant the National Teachers Union (NUT).